Be the first to share your favorite memory, photo or story of Pansy. This memorial page is dedicated for family, friends and future generations to celebrate the life of their loved one. 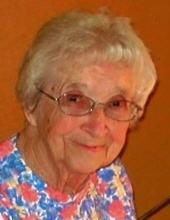 Pansy (Edgar) Six, age 98, of Waynesburg, PA (formerly of Pine Bank), passed away Friday, April 5, 2019 at Washington Health System Greene, Waynesburg, PA.
Born December 20, 1920 in Brave, PA, she was the daughter of the late Thompson Ruben (Buckshoe) and Goldie Minnie (King) Edgar. Pansy was a resident of Waynesburg since 1992. She was a member of Pine Bank United Methodist Church. Pansy married George Francis Six, Jr., on July 17, 1937 and were married until his passing on April 28, 1998. Pansy was a Cafeteria Aide for West Greene School District for 11 years until she retired in 1982. She was a member of the Quilting Circle in Grandview and Waynesburg Lodge O.E.S. Chapter 135. Pansy also enjoyed gardening. Pansy is survived by two children, Eugene Six, of Jacksonville, FL, Edward Six, of Pennsboro, WV; eight grandchildren; 13 great grandchildren, 10 great-great-grandchildren,; two sister-in-laws, Nelda Whoolery and Betty Young; one brother-in-law, Kenneth Six. In addition to her parents and husband, she was preceded in death by one brother, Neil Edgar and one daughter, Marlene. Friends will be received on Monday April 8, 2019 from 3 - 7 p.m. at Kesterson-Rush Funeral Home, LLC. 3275 W. Roy Furman Hwy. Rogersville, PA 15359. Telephone: 724-499-5181. A funeral service will be held on Tuesday April 9, 2019 at 11:00 a.m. in the funeral home with Pastor Cynthia Deter, officiating. Burial will follow at Rosemont Cemetery, Center Twp., PA. At the family’s request, donations may be made to a hospice or church of your choice in honor of Pansy. To send flowers or a remembrance gift to the family of Pansy Edgar Six, please visit our Tribute Store. "Email Address" would like to share the life celebration of Pansy Edgar Six. Click on the "link" to go to share a favorite memory or leave a condolence message for the family.